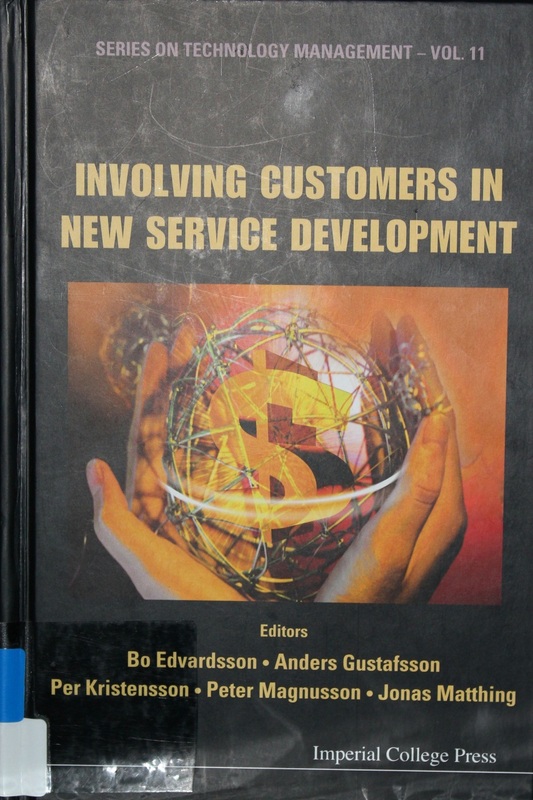 The background for this blog post is the book “Involving Customers In New Service Development” edited by Bo Edvardsson et al. The Book is a collection of some breakthrough researches on customer’s involvement in various industries. Successful management of different development process stages enables integrating customer involvement in company’s innovation system. Involving customers allows possibilities for creative solutions, but is also rather prone to problems. Management must understand how selected research and development methods affect and direct the whole innovation process. The role of customer involvement depends on many factors –Type of industry, company’s goal with the customer involvement, budget, mind-set, stage of the development etc. For instance, if the goal is to improve the product incrementally, the traditional market research can work, however, it is unlikely a method for new developments. More traditional research methods can help to find out which customers to involve in the development process. For example, having a narrow customer group may result in over-customization of the service for that group, which may not be the representative of the most common user group. On the other hand, having a broad customer group may lead to uncertainty due to diverse customer demands (Martin et al. 1999). 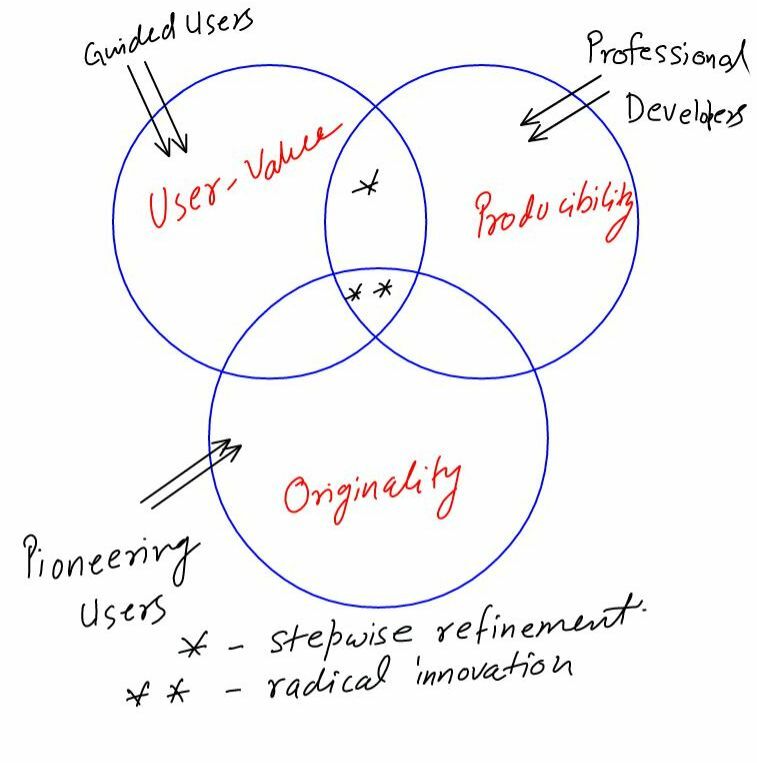 How to Involve the Customer – Balancing Originality, User Value, and Producibility? It matters how users are involved in the innovation process. If a user gets technical knowledge and some feedback on the ideas with respect to technical feasibility, organizational issues, previous experience of a similar product then it is more likely that the idea generated is of a high user value but it is not original and not easy to implement. If user does not get any hint about the technology or other aspects of a product or service, it is more likely that the idea generated by the user is original, but it may not have high user value and can be difficult to implement. If technical team members envisaged an idea, it is more likely that the idea is not original, not of high value but it is easy to implement. Therefore, development management must understand the effect they make with selected development methods and information they choose to give out. Broadly there are three ways in which customers can be involved – Say, See, and Make. Say method (verbal communication) is useful for the past information for a product or service, which is simple enough to be described in words. A feedback form or service story can be classified under Say method. The See method (Observation of a customer) is appropriate when a company wants to have present information of a service or product in use. For example, a car manufacturer observing user driving a car in different traffic conditions. Make method (Customer produces ideas of their own) is appropriate to find ideas of the future. One example for the Make method is OpenSource Software Development. Say and See methods are more suitable at the end of the development cycle when a prototype is ready. These methods are also good when a qualitative analysis is required for improvements by finding the gaps between expectations and perceptions. Make methods are more suitable when companies are looking for innovations. See and Say methods as traditional focus groups or user labs don’t necessary offer genuine innovation, nor authentic user experience, only customers thoughts on existing products or services. For example if the company uses Say method for innovative ideas then it is more likely that it gets the ideas which are already envisaged by someone in the development team and can lead to the wrong perception that the customers are not innovative. When the customer gets a chance to develop ideas in their own environments, more original ideas emerge compared to the ideas from the subject knowledge experts. Another issue in overall customer involvement is confidentiality, a possibility of revealing information to competitors. This is probably an unavoidable problem, even if the selection of the project participants would be extremely careful. Another angle to face the situation could be by building the development project fundamentally collaborative, and keeping all parties equally motivated. Motivation in general throughout the process is vital to successful results. In a research done in VolvoCars development project was found out, that a motivated person in development management was crucial to the whole project. The person was needed to be genuinely interested of the project and care about the outcome. During the design process also participating customers must feel like they are part of the team and finding the problem personally important. This created the most innovative ideas. Involving customers in the development process also involves them more closely to the company. If the development process is designed and carried away successfully, the customers may adapt the whole process as a trial and help significantly with commercialization, offering word of mouth information to other potential users. What Are Good Ideas Made Of? As the focus of most development projects is to create ideas that can be actualized in the business, doing a thorough screeningand business analysis on created ideas is needed. For commercially viable ideas, it should meet at least two of – Originality, High User Value and Producibility (Page 151). Most of the good ideas fall into the category where they do not meet at least two of the above criteria. This leads to some new ways to evaluate new ideas. For instance the traditional funnel theory of idea, in which at the broader end of the funnel you have plenty of incoming ideas, which go through the screening process, and at the narrow end of the tunnel you get the good ideas. In this process some original but having potential to be converted to a good idea can be missed. 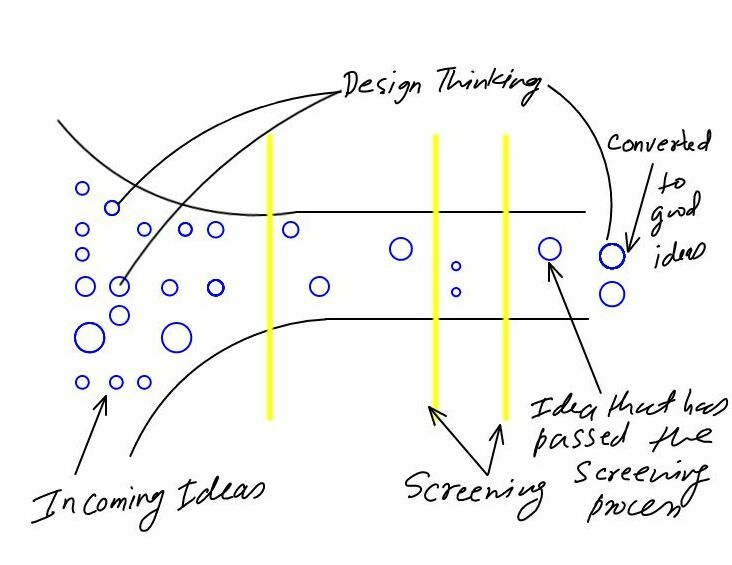 By replacing screening process withselection process with the help of a group of designers, it is possible to convert an original but impractical to implement idea to easy to implement yet original and high user value idea. In above video P. Kristensson explains how in development project research revealed that the customers in fact made more innovative ideas than professional designers for new products or services. The professionals’ ideas were easier to implement in the organization. Successful development of new services or products is a result of a deep customer knowledge and clear development focus. Customer interaction as a key element of company’s innovation process could lead into previously unknown solutions. So it is a good idea to involve customers at the beginning of the innovation process. To involve customers in a constructive way, companies need to have focus so that the goals of the customer involvement at each development stage are set to get greater ROI from the customer involvement. As a conclusion, customer involvement in development process can be a highly beneficial for the company. It is vital to design and manage the process carefully, still keeping the development group organic to reach effective innovation. This blog is Posted as an assignment for SID course “New Service Development” by Laurea SID students Manish Singh and Teija Hakaoja.